Advancement Via Individual Determination allows students to achieve the learning outcomes they are truly capable of. With a proven track record of success beyond secondary school AVID nurtures academic potential and provides students with the skills for success in the 21st Century. The Elective Program offers an advanced learning environment to support students as they prepare for success at university. At KSC our Elective Program runs from year 7-11, where students are taught a rigorous skills based curriculum to support high achievement. The AVID Elective curriculum is founded on proven methodologies based on Writing to Learn; Emphasis on Inquiry; Collaborative Approach; Organisation and Critical Reading (WICOR). AVID Elective students also take part in academic tutorials and receive academic mentoring from Victoria University students to support achievement in all content areas. Above all else, AVID Elective students must demonstrate a high level of determination to succeed academically. Potential applicants will also be required to complete an application, test and interview. Since 2013 over 50 KSC teachers have attended the AVID Summer Institute and all Learning Areas are now working collaboratively to incorporate AVID strategies to enhance learning in all lessons. In addition, our Student Success Program ensures all students are given support to master the es- sential academic skills for success in secondary school education. 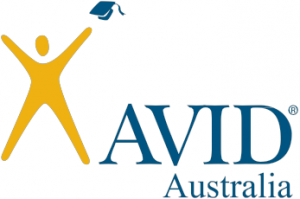 Kurunjang Secondary College is a proud member of the AVID Australia community. “ AVID has helped me realise my future goals and how to achieve them.” Tirishma, AVID student. Want to know more about AVID at Kurunjang ?